A good site, pure water in abundance, and a convenient fuel supply, are the features of a temporary camp that should be given first consideration when starting out to enjoy a vacation in the woods. The site should be high and dry, level enough for the tent and camp fire, and with surrounding ground sloping enough to insure proper drainage. A sufficient fuel supply is an important factor, and a spot should be chosen where great effort is not required to collect it and get it into proper shape for the fire. When locating near streams of water be careful to select a spot above high water mark so the ground will not be overflowed by a sudden rise of the stream. Do not select the site of an old camp, as the surroundings are usually stripped of all fuel, And the grounds are unclean. If the camping party consists of more than two persons, each one should do the part allotted to him, and the work will be speedily accomplished. Remember that discipline brings efficiency, and do not be slack about a camp just because it is pleasure. One of the party should attend to the camp fire and prepare the meals while another secures the fuel and water. The tent can be unpacked and the ground cleared by the other members of the party, and when ready, all should assist in raising the tent, especially if it is a large one. An ordinary A or wedge tent is sufficient for one or two campers. Where you do not wish to locate permanently, this tent can be set up and taken down quickly. It should have a ring fastened to the cloth in each peak through which to pass a rope or line to take the place of a ridge pole. Such a tent can be pitched between two trees or saplings, and, after tying the rope to the trees, it can be tightened with a long forked stick, placed under one end of the rope. If two trees are not conveniently located, then two poles crossed and tied together will make supports for one or both ends, the ridge line running over them and staked to the ground. Clear the selected spot and lay out the lines for the tent, camp fire, etc. On a chilly night, the A tent is quite advantageous. The stakes can be pulled on one side and the cloth doubled to make a lean-to, open on the side away from the wind. A fire can be built in front and the deflected heat on the sleeper will keep him comfortable and warm. For larger parties, the wall tent with a fly is recommended. These tents can be purchased in various sizes. The fly is an extra covering stretched over the top to make an open air space between the two roofs. It keeps the interior of the tent delightfully cool in hot summer weather and provides a better protection from rain. The fly can be made extra long, to extend over the end of the tent, making a shady retreat which can be used for lounging or a dining place. 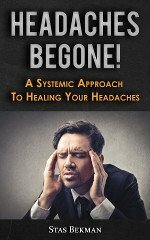 Where mosquitoes and other insects are numerous, it is well to make a second tent of cheesecloth with binding tape along the top to tie it to the ridge pole of the regular tent. The sides should be made somewhat longer than the regular tent so that there will be plenty of cloth to weight it down at the bottom. This second tent should be made without any opening whatever. The occupant must crawl under the edge to enter. The cheesecloth tent is used inside of the ordinary tent, and when not in use it is pushed aside. 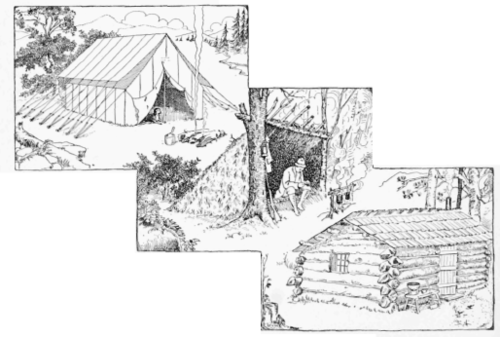 Two camps are illustrated showing the construction of a lean-to for a temporary one-season camp, and a log cabin which makes a permanent place from year to year. (A more elaborate and more expensive camp was described in the May issue of this magazine.) The construction of these camps are very simple. The first is made of poles cut in the woods. A ridge pole is placed between two trees or held in place with poles of sufficient length, set in the ground. Poles are placed on this at an angle of about 45 deg., forming a lean-to that will be entirely open in front when finished. The poles are covered, beginning at the bottom, with pine boughs, laid in layers so as to make a roof that will shed water. A large fire, built a short distance from the open front will make a warm place to sleep, the heat being reflected down the same as described for the A tent. A good permanent camp is a log cabin. This can be constructed of materials found in the woods. Trees may be felled, cut to length, and notched to join the ends together at each corner so as to leave little or no space between the logs. The roof is constructed of long clapboards, split from blocks of wood. The builder can finish such a camp as elaborately as he chooses, and for this reason the site should be selected with great care. There is no better way to make a camp fire than to have a large log or two against which to start a fire with small boughs. Larger sticks can be placed over the logs in such a way as to hold a pot of water or to set a frying pan. 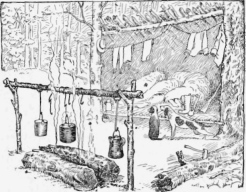 Forked sticks can be laid on the log and weighted on the lower end with a stone, using the upper end to hang a cooking vessel over the flames. Two logs placed parallel, with space enough between for the smaller sticks, make one of the best camp cooking arrangements. Two forked sticks, one at each end of the logs, may be set in the ground and a pole placed in the forks lengthwise of the fire. This makes a convenient place for hanging the cooking utensils with bent wires. A number of small things must be added to this list, such as pepper, olive oil, sage, nutmeg and vinegar. If the weight is not to be considered, canned goods, preserves, jam and marmalade, also vegetables and dried fruits may be added. Do not forget soap and matches. Food can be kept cool in a box or a box-like arrangement made of straight sticks over which burlap is hung and kept wet. This is accomplished by setting a pan on top of the box and fixing wicks of cloth over the edges. The wicks will siphon the water out evenly and keep the burlap wet.